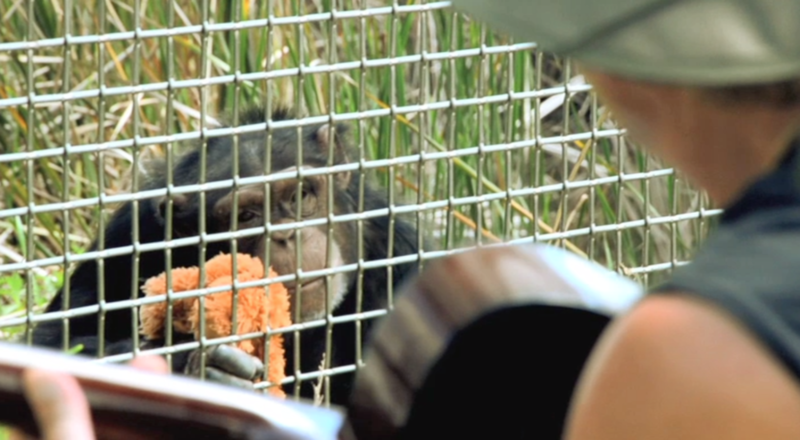 It has been a life changing experience meeting great apes that had once been subjected into laboratory research, used in entertainment or from the pet industry and now living safely in true sanctuary. Making friends, and sharing music with them is one of the most beautiful things I've ever experienced. "Harry Hmura uses his musical talent, fueled by his passion, to draw attention to the plight of Chimpanzees and other Great Apes living in sanctuaries. Skillfully blending his music with the calls of the apes Harry has created a magical experience. And every penny raised makes a difference for the apes – and the dedicated people who struggle to care for them. My gratitude to you Harry and to all of you who buy his music. It truly makes a difference." "The first time I listened to this intensely personal music I cried. It’s not only beautifully composed and produced, but hearing the vocals of the apes in harmony with the music took me on an amazing emotional journey. Bravo Harry!" I AM, I AM is composed and produced by guitarist Harry Hmura; artist, performer, songwriter, guitarist of the “Halo” video game series. Inspiration from Dr. Jane Goodall and all the many apes he met in sanctuary, the albums story, with original music, is based on true events of the past and present lives of great apes from around the world. To Everyone who gave and shared their talents in making this album, to all the apes, an endless Thank You! Great ape, human vocals, and a guitar-led band come together in a powerful story of who and what I AM, I AM. With original music and based on true events of their lives, listen to vocal expressions and sounds of the great apes singing, laughing, crying, clapping, outcries and more. A journey of life, love, celebration, fear, and survival; living freely in the forests, births and celebration, captured-subjected into bio-medical research laboratories, loss of habitats and life, orphaned, refuge in true sanctuary. Official video "Holding On Tonight"
Harry began playing guitar at age 7. He met B.B. King at 13. He started his career touring with Grammy Award Winning blues artist James Cotton as he was turning 21. He then followed up touring Europe with Grammy Award Winning blues artist Sugar Blue, who had recorded and toured with the Rolling Stones. He formed his own band, a fusion of progressive rock and improvisatory freeness of Jazz called, Countdown. Harry has performed on the world renowned, Halo, the video game series. He's recorded for a wide range of television shows on network and cable stations, NBC, A&E, Discovery, Biography, History, ESPN, VH-1, radio and TV commercials, including co-writing / producing, and touring with smooth jazz artist, Brian Culbertson. Harry has played alongside, Muddy Waters, Buddy Guy, Dickey Betts, Johnny Winter, Jeff Healey, Elvin Bishop among others. He continues performing with his own band, travels, and is part time faculty at Columbia College Chicago. The album I AM, I AM - Harry brought Bob Lizik on bass and Richard Jackson on drums and percussion, background vocalists and a children's choir with the many voices and sounds of great apes and nature from around the world, in a unique recording like never heard before. Every musical instrument, vocals human and great ape including their natural sounds, to wind and rain, birds, even insects were all recorded naturally in a live setting. Harry wanted All and Every sound, recorded by himself or assistants, to be true to the recording and used originally and accordingly per song. There are no internet, library sounds used. Geri having a close up look at her original art work on a one of its kind guitar the "Orangucaster" that she, Popi and Louie, orangutans at the Center For Great Apes, painted.